2018 was a disastrous year for U.S. meat recalls. Firms recalled a grand total of 125 meat and poultry products, removing 20 million pounds of unsafe or improperly labeled products from public distribution (1). In September 2018, Cargill Meat Solutions, a Colorado-based meat producer, recalled 132,606 pounds of ground beef contaminated with E. coli, resulting in 18 illnesses, six hospitalizations, and one death (6). Two months later, JBS Tolleson, Inc., an Arizona-based meat producer, recalled 12.1 million pounds of meat infected with salmonella, resulting in 331 illnesses and 91 hospitalizations (5). A lengthy recall process not only increases the number of U.S. lives endangered, but also decreases firm, shareholder, and farmers’ profits. Each meat recall, on average, costs firms 10 million in direct costs, at least a 0.63 percent decrease in stock price, and a $109 million decrease in shareholder wealth (2,3). After a two-year rise in recalls due to E. Coli, a 2018 study found that farmers lost about $454 million in revenue; conversely, after a two-year decline, revenues increased by $1.07 billion (8). Consumer trust is also compromised, as polls indicate that 55 percent of customers would switch brands temporarily following a recall and 21 percent would completely avoid any brand by the firm (2). Dangerous and costly meat recalls are a result of an inefficient U.S. meat supply chain, where information is not quickly nor honestly shared among members of the network. By increasing supply chain traceability, trust, and transparency, Blockchain, is a distributed ledger of verified transactions. The ledger is accessible and visible to multiple people in the network in a way that is more secure. The process of handling electronic records and transactions through a Blockchain platform may have the potential to reduce inefficiency and save the U.S. billions of dollars. One of Blockchain’s primary benefits is its ability to trace information and activities throughout a supply chain. “It’s the equivalent of FedEx tracking for food,” says Frank Yiannas, The Deputy Commissioner for Food Policy and Response at FDA and former President of Food Safety at Walmart (14). Every upload of information, or transaction, on a Blockchain requires independent verification from all stakeholders and digital signatures to authorize the information’s legitimacy. Currently, paper-based systems are still used in maintaining these records. This process is resource-intensive, costly, and time-consuming (14). A January 2018 IBM and Maersk study estimated that shipping a single container of flowers can require more than 200 communications, sign-offs, and approvals, accounting for up to 20 percent of shipping costs (13). Using a Blockchain ledger not only reduces supply chain costs by at least 10 percent (13) but also decreases tracing time from several months to just 2.2 seconds (12). Manufacturing firms can proactively pinpoint exact batches of contaminated meat in near real-time, thereby improving public safety, providing detailed information to consumers, and building trust long-term. With meat recalls, firms and regulatory bodies must search for information pointing to the right source, notify consumers, and then take action. Blockchain can help streamline this process through its irreversibility and verification of records. Each transaction is permanently linked to all prior records on the chain, leading to increased trust and stakeholder accountability (10). The ledger inherently incentivizes stakeholders to input and share correct information, since anything to the contrary is easily proven false by the other blocks on the chain. Research conducted by Queen’s Centre for Assured and Traceable Foods showed that in the last 10 years, only 21 percent of recalls were detected by the firm (2). Blockchain, through its immutable nature, can help firms proactively identify recalls and their causes instead of reactively relying on regulatory bodies, resulting in increased stakeholder trust and cost savings. The meat supply chain includes multiple steps: farm to manufacturing firm, manufacturing firm to wholesaler, wholesaler to retailer, and finally retailer to consumer. Critical information is gathered at each step, including expiration dates, storage temperatures, batch numbers, factory and processing information, and farm origination details. However, this information is infrequently shared, and low supply chain visibility often leads to significant operational costs. According to the Queen’s Centre for Assured and Traceable Foods, 56 percent of recalls result from operational mistakes, like mislabeling or production contamination. 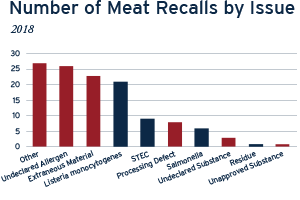 In 2018, 88 out of 125 total U.S. meat recalls were due to operational mistakes (1). With Blockchain, every stakeholder on the supply chain would have access to the distributed ledger and be able to quickly resolve operational issues through consensus and transparent communication. Strategic process improvements are critical in Blockchain deployment, as all stakeholders (i.e., farmers, manufacturing firms, government, consumers) engaging with and adding information to the blocks across the chain must understand its purpose and function. Implementing Blockchain and process improvements, simultaneously, can significantly enhance manufacturing firms’ ability to recognize, verify, and efficiently resolve concerns about sourcing, processing, and recalls. The next steps for meat supply chain stakeholders to implement Blockchain technology are to: 1) educate stakeholders (including regulatory agencies) on Blockchain benefits; 2) encourage strategic process change implementation aligned with corporate strategy; and 3) learn from incumbent food firms using Blockchain, like Walmart, Starbucks, and IBM, to create and test pilot programs, which on average take at least two years to complete. Strategically implementing Blockchain will help stakeholders increase traceability, trust, and transparency, leading to greater responsiveness, efficiency, and resilience in recall scenarios. Dan Gorman is an MBA Candidate at American University, Class of 2019. Shreya Walia is a JD/MBA Candidate at American University, Class of 2020.